A new update has popped up on HWiNFO, which adds support for several particularly interesting CPUs and graphics chips. Starting things out with the CPU side of things, we see the support for Intel’s Ice Lake-SP (ICX) and AMD’s StarShip and Matisse Processors. Switching to GPU, the change log also includes “Navi” and future AMD Vega graphics chips too. What’s rather interesting about this is that there’s a separate mention of Radeon RX Vega M (the mobile Vega chips), which hints that indeed this is either the 7nm Vega we’ve discussed (built for machine learning), or something… else. Navi is also mentioned as a cliff note, which as you probably know, is AMD’s next true next generation GPU. Vega 7nm is to get the process down, and then they’ll use that as the basis of Navi. So what exactly are these new mysterious processor chips and what do we know about them? Well, let’s start things off with Intel’s Ice Lake-SP. This is the enthusiast HEDT (High End Desktop) variant of the chips which you’d often find in a server. Think Skylake-X type of processor, essentially. It’s likely that we might see this new architecture launched after Cascade Lake-X which is being touted to launch in Q4 2018 – at least according to an Intel roadmap which leaked in the closing weeks of last year. 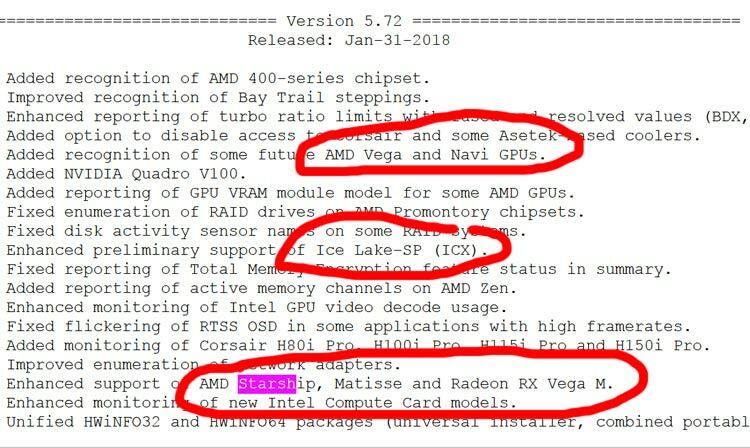 AMD Starship’s first mention was dated back in the early mists of 2016 from a data-center focused slide. 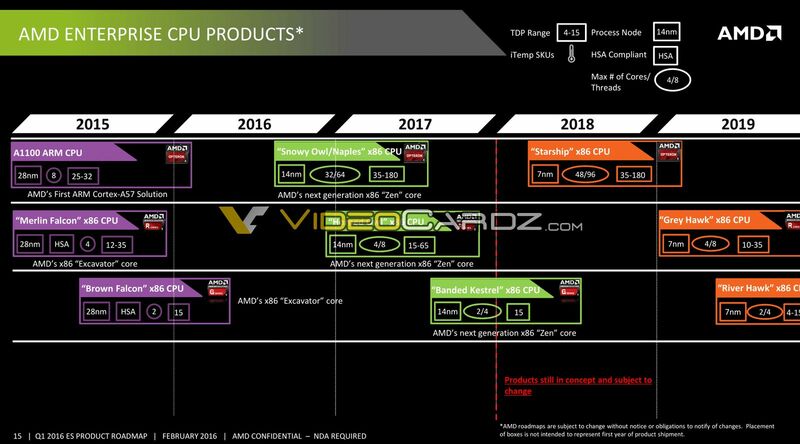 While this roadmap is likely pretty outdated, the fact that HWiNFO lists this chip pretty much confirms that it is indeed ‘still a thing’ and AMD are actively working to release it. If the specifications in the leaked roadmap are accurate, StarShip will be built on a 7nm process, with a staggering 48 processor cores, and thanks to SMT, AMD’s StarShip will be capable of running up to 96 threads, and we can presume it will also have a TDP of upto 180W on the highest end SKUs. Obviously the chips will be following on the Epyc series of CPUs from AMD, which the company are finding to be making a rather nice impression with customers right now. StarShip being based on 7nm (if it is accurate) likely means that it is indeed using the Zen 2 cores, and NOT Zen+. Although given the age of the roadmaps, it is possible that AMD have gone back on this, and it will instead be built from the Zen+ 12nm processor. Mattise is the final chip of note, and it is the internal codename AMD use for the Zen2 architecture. As we’ve discussed several times now, it is the ‘true’ successor to Zen, rather than Zen+ which really is more a small tweak in architecture and a process shrink to 12nm. There will of course be improvements to the IPC, and likely clock speed increases to boot. According to AMD’s own Dr Lisa Su, Zen 2 has finished in terms of design and tapeout, and they’re aiming to start shipping it to select partners by the end of the year. This is possibly a good sign for those looking at StarShip too, as the leaked roadmap pegged that particular CPU to 2018. Its probable this has now slipped to 2018, and might indeed be further confirmation that StarShip will be using the improved Zen 2 architecture. But of course, until there’s concrete information, its only a guess. Tagged with AMD, amd mattise, cascade lake, ice lake, ice lake-x, starship.